Our professional storytellers and actors will inform and entertain as you go behind the curtain to explore the unseen areas of the Royal and Derngate auditoria in this dramatized performance backstage tour. Listen to the real life stories of the people who were involved in shows here throughout the decades; find out how our Made In Northampton productions are created with a visit to our workshops; discover where Dr Who was filmed and where Errol Flynn learned his craft, and if you are lucky, you may even meet our resident ghost along your way! “Many thanks for a fantastic tour this morning. 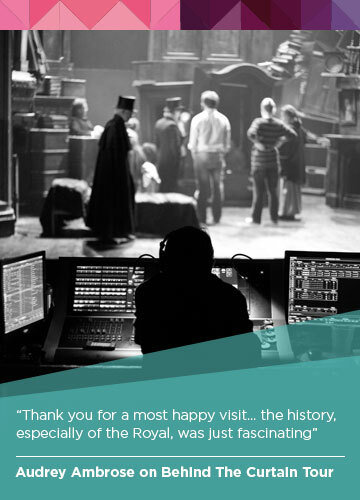 You and your colleague brought the history of the theatre to life, we loved it! We learned so much of the hard work that goes on to make a successful production” Customer comment. Information on how to book for Behind The Curtain can be found here. Customers are advised to wear flat shoes. Unfortunately the standard tour is not suitable for those with access requirements. Schools are taken on a guided tour around the building, including an option to visit the Derngate auditorium control room to have a go at operating the lights. Accessible tours suitable for those with access needs, hearing or visual impairment are available with prior booking. Please contact Erica Martin, Creative Learning Associate for further information or to book a School, Exclusive or Accessible tour. We offer pre and post-show talks, providing a fascinating insight into the world of the theatre and a chance to hear from the creative teams about their process on specific productions. We also provide opportunities for schools, groups or societies to meet with staff to discuss the workings of the theatre and careers within the creative industries, subject to availability. For more information regarding the above, please email Erica Martin.